Der berühmt-berüchtigte Klassiker unter den CPUs, welcher schon im COSMAC ELF und ab 1979 auch auf der MPU in PLAYMATIC Geräten verwendet wurde. 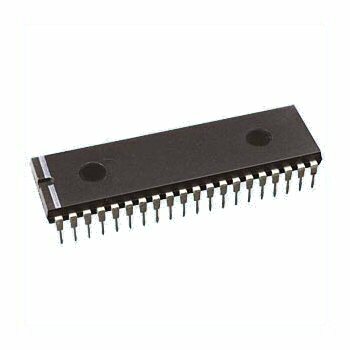 The CDP1802 family of CMOS microprocessors are 8-bit register oriented central processing units (CPUs) designed for use as general purpose computing or control elements in a wide range of stored program systems or products. The CDP1802 types include all of the circuits required for fetching, interpreting, and executing instructions which have been stored in standard types of memories. Extensive input/output (I/O) control features are also provided to facilitate system design. The 1800 series architecture is designed with emphasis on the total microcomputer system as an integral entity so that systems having maximum flexibility and minimum cost can be realized. The 1800 series CPU also provides a synchronous interface to memories and external controllers for I/O devices, and minimizes the cost of interface controllers. Further, the I/O interface is capable of supporting devices operating in polled, interrupt driven, or direct memory access modes.